Imagine you’re really really really cold. You want to eat chips. Also cheese. If possible there should be some meat involved. And for this reason Canadians are beyond brilliant. 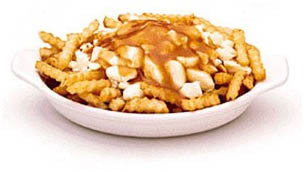 Blessed with a climate that could freeze an eskimo’s snoo snoo they’ve invented poutine – a big mess of crunchy chips smothered in all that’s wrong in the modern diet. It’s basically cheesy chips with gravy, but somehow so much more. The inspired choice of cheese is the rubbery white kind which squeaks across your teeth, and the gravy is only a shade meatier than a sauce of salt and cornstarch, carefully avoiding a pretention to flavour which could ruin an otherwise perfect bland medley of oily-salty-crunchy-good. Better yet poutine comes in the kind of portions which you initially think you’re never going to finish, and end up wishing you’d gone large, particularly as it acts as a kind of internal radiator in cold weather. As the equivalent of the Canadian kebab, you can buy it from fast-food style places, but it’s so popular (even Canadian McDonalds does a version) that there are gourmet versions and a place in Montreal even makes poutine with foie gras. b) You serve it with maple syrup. Which are both key cornerstones of any Canadian recipe. 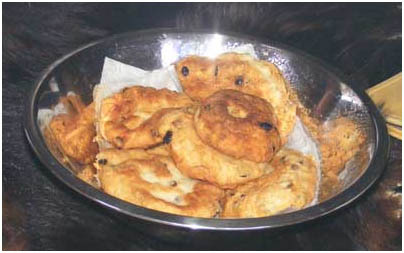 We had this after a dawn ‘pipe ceremony’ – the kind of thing you see in old-style country and westerns where the white people are welcomed in to smoke a peace pipe with the chief. It starts with a long blessing of the tobacco and liberal dispensation of sage smoke, which is a cleansing thing, and the pipe then theoretically achieves the internal job of what the external herbs have done to the air around you. I love anything even vaguely spiritual and with a toasty fire, my own pair of moccasins and the promise of food at the end of it this was about the best religious experience I’d ever had (Christians are notoriously stingy with the wafers and I’ve noticed other faiths seem to have a certain meanness where food and heating are concerned but maybe I’m missing something important about God). 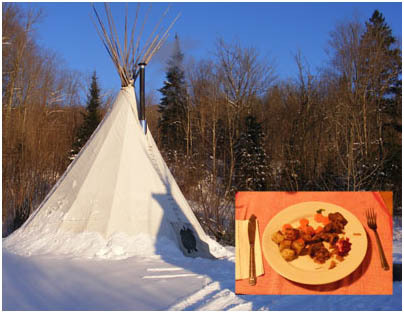 I ate this moose just before sleeping in a tepee at -20C so you could say I was doing my very best to go native. 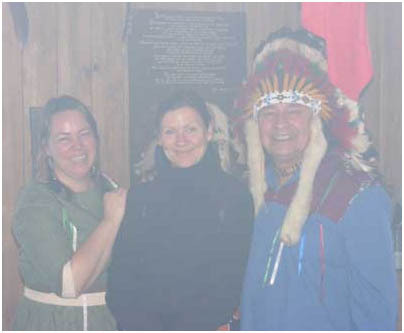 It’s a lesser known fact that Canada also had a native population whose peaceful customs were displaced by roving packs of mad evil missionaries, and spending time with one of the tribes-people was really interesting. My favourite story was that tribes used to adopt orphaned baby animals and let them sleep in their tepees for a few months during winter. One year they adopted a moose which after a happy six months refused to leave and they had to build a special tepee for it. It then got a taste for bread and took to swimming out and overturning incoming canoes if it could smell they were carrying loaves. So people rowing in had to shout ‘we’ve got bread in the canoe – call off your moose!” before attempting to land. Which brings me neatly to eating the stuff. Not my favourite experience I have to admit. The meat was great – like a mixture of goat and beef. But the recipe was a kind of casserole and various organs were thrown in which toughened up during the cooking process and made most of it really gristly. I properly filled my plate fearing the cold night ahead of me and then had to grind through a huge fibrous pile of meat. Luckily dessert was cherry pie with ice cream. Oh and the tepee proved to be really snug and warm – honest. There was a fire which you had to keep loading up but it was warmer than any of the houses I’d been in.